I gained a BA in Graphic Design (1992); a PgD in Communication Design; a PhD (A description framework for typeforms, an applied study, 2003) from Central Saint Martins; and a Pg Cert in Teaching and Learning in Art and Design (2010) from CLTAD. I have worked freelance as a designer for publishers such as Penguin Books and Phaidon, and on several projects with Phil Baines. In addition to design work, I am a regular contributor to Eye magazine, Matrix, and other journals, and author of 'Signs, lettering in the environment' with Phil Baines (Laurence King 2003). I sit on the Executive Committee of St. Bride Library where I have been curator of their conferences and events since 2003. 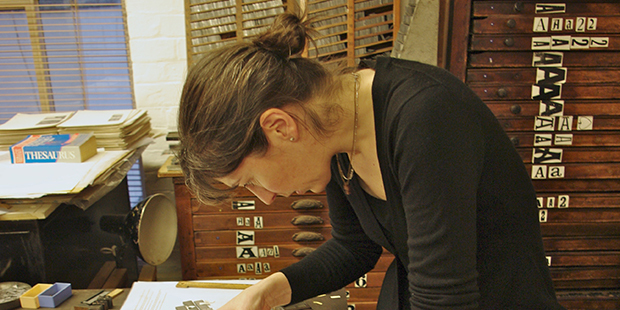 I began teaching on the course in 1999 and became Senior Lecturer in Typography in 2002. I also supervise a number of PhD students at Central Saint Martins and am External Examiner at Lincoln University. With Phil Baines, I curate the Central Lettering Record, part of the College’s Museum and Contemporary Collection.